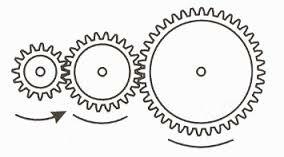 You can see a gear as a lever with the center as a focal point and the radius of the gear as load arm. When a force is transferred from a small sprocket to a larger, less force is required. The large gear will run slower than the drive gear. The power ratio is comparable to the circumference (or tooth) ratio. For both wheels, you can also set: number of teeth x speed = speed x number of teeth. A wheel between does not change speed or power, only the direction. By using toothed wheels of different size, so you can convert speed in power, or vice versa. As with the gears of a bicycle. To slow the motion, there is an ingenious mechanism: the brake. That should just deliver a lot of friction (resistance).